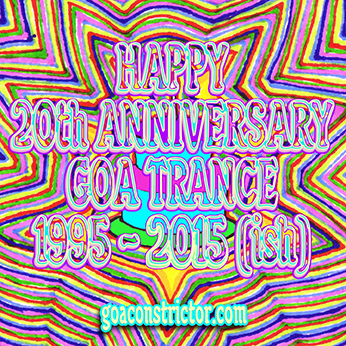 Goa Trance, while it did begin popping up a bit here and there in 1993 and 1994, was truly birthed (according to my KNOW-EVERYTHING-ABOUT-GOA brain) in 1995. So that means, 2015 is kind of, for lack of a better origin story, the pseudo (like the science often sampled in the songs) birthday/anniversary of what has been known as Goa Trance. After serving up a dark and rich winter blizzard of a mix, the twenty year journey into spring creeped slowly into some progressive, sparkly, and techno-ish sounds of the Goa realm. And now; now it’s summer! As summers are known to do, this mix is bright, warm, lush, and full of the stuff that fills the spirit. The tracks skip through the fields of 90s vinyl-only and hard to find rarities to items a bit more fresh n crisp. Only one more season to go in our four-part series celebrating twenty years of Goa trance magic. Stay tuned for more! In case you missed the others, they can be found here: winter, spring, summer, fall. 100% free range, cage free, organic Psychedelic. Available at a Psychedelicatessen near you. This entry was posted in MiXeS and tagged Bass Chakra, California Sunshine, Doof, GMS, Green Nuns of the Revolution, Jon the Dentist, Katy Perry, Kirna, Mantrix, Montti, Ololiqui, S.U.N. Project, Sussex, The Infinity Project, The Sebastians, The Spangle Factory by admin. Bookmark the permalink.